The rivalry between Sega and Nintendo back in the day was the stuff of legends; there arguably has never been a more heated competition between two game companies since. After Nintendo's near monopoly on video games in the NES days, Sega's Genesis console represented a tectonic shift and proved that there was room for other companies in the business. It must've been all the more shocking, then, when it was announced years later that the two mascots for the companies would be sharing a game. 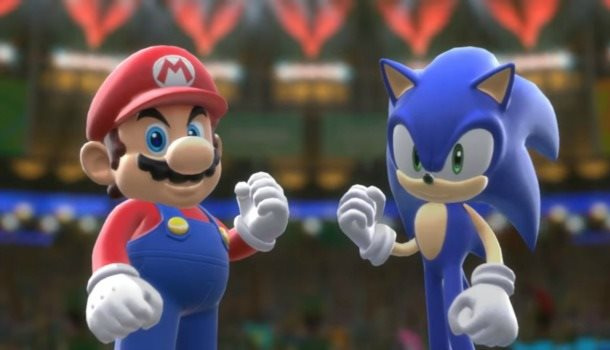 I always thought it would be great to have Sonic and Mario in the same game, but if you put them in an action game, the feeling of speed is very different, so it wouldn't have worked. 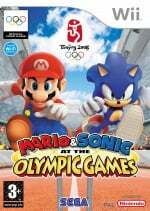 I started this conversation with Nintendo, and then later when Sega picked up the license for the Olympic Games video games, we had that foundation with Nintendo to say 'We want to bring Sonic and Mario together and have them appear in the same world and have them compete against each other, and we're going to use the premise of it being the Olympic Games and these characters are participating in the Olympic Games together to make that happen. It was the first great conversation about getting these characters together to compete and have fun together. For the full interview, check it out here; there's plenty of interesting history on Sonic's gradual shift to Nintendo consoles. What do you think? Do you enjoy the Mario & Sonic games? Would you like to see the two in a platformer someday? Drop us a comment in the section below. @Xjay I think so too. Perhaps there could be fast and slow levels with either character taking the lead. They could definitely find a way. Huh, pretty cool to see how this series started. I know a lot of people hate this series, but I've always found it to be harmless fun. Not great, but certainly not bad (besides Sochi and Rio 3DS). Two series that I grew up with and two characters that I adore. But I cannot stand the Olympic crossover games. If Sega and Nintendo ever decide to make a crossover platform game with these two guys and are able to make it work, then I'm down with that. For now, I'll just have to settle with Smash Bros with Sonic and Mario in the same game together. @MitchVogel Exactly, the reasoning behind this game not having been made is terrible when you consider the fact that it's a GAME DEVELOPERS job to create/develop a concept into a working game. I think a Mario and Sonic RPG would work better, no? Mario has RPGs, Sonic has one...I think it works. Just make it like Generations with Act 1 being Mario and Act 2 being Sonic. It can have levels from both series' histories. That's also a great idea. A platformer wouldnt be hard. Just make some parts of the level Mario type and others Sonic type and have it where you can tag in and out with Mario and Sonic. I would love to see a 3D platformer with the two. I'd imagine both having different gameplay types (Sonic's based on the modern Generations levels and focuses on speed, while Mario's based on 3D World with a slower paced, more platforming focus) and share enemies as well as power-ups (imagine a Fire Sonic). Overall, though, I'd love to see them do more varied stuff together (my prefered option would be Mario & Sonic at Formula One - featuring courses from real life and the Mario and Sonic universes). Id love to see a 3D SA2 style thing with team sonic and team mario. It'd be better if thry both played at the same time though somehow rather than seperately. Maybe as customisable duo's? Mario and Sonic, Knuckles and Luigi etc. Imagine the gameplay mechanics available just putting those names together! So the Olympics is the most realistic way that these two characters could feature in the same game world eh? Bit weird, but sure, okay. So did they give Sonic performance retarding drugs or something? Surely he would win EVERY SINGLE EVENT?? Lightning speed VS middle age, too much pasta and woefully inadequate clothing for athleticism. Place your bets gentlemen. SEGA - "Hi there, could I speak to Nintendo please?" SEGA - "Hi Nintendo, how's things?" Nintendo - "Great, the Wii has been a massive success." SEGA - "Good, good. Anyway, you know how I've been dragging my mascot Sonic through the mud for a good decade or so? Well, I'd like to pitch an idea to you about how we can do the same for your boy Mario..."
Thing is, could you ever think classic Sonic gameplay, Mega Man-esque shooting and Gunstar Heroes-style run-and-gun action would go hand in hand? Neither did I, but that didn't stop Freedom Planet. Same here. No Super Mushrooms, have holed coins to act as Rings, and use all other powerups such as the fire flower; then have the gameplay be slightly slower than Sonic (like the first few games) but faster than Mario. Now add a Sonic-esque jump to Mario and voilà, here's the mashup. I like how Tom Kalinske asserts that that Nintendo pressured stores into not carrying the Master System even though there was absolutely zero evidence to confirm at that allegation. Even our justice department ended up never finding any evidence to sustain Sega's allegations. Interestingly, Tom Kalinske and other Sega of America execs weren't unfamiliar with these types of allegations. As a generation earlier Atari, Coleco, and Mattel made it a business practice to accuse the other of stuff to retailers in hopes getting thier competition yanked from shelves. A practice that Tom most likely engaged in while he was with Atari. Nice projection there, Tom. Though the control of Rom chips is a puzzling allegation though. Hey Tom, wasn't it brought out out in court documents during your patent infringement case against Accolade that it was revealed that Sega controlled the manufacturing of cartridges as part of the licensing agreement that third parties signed? Yeah as the years go by I remain firmly convinced that Tom Kalinske was a crap flinging weasel who was more than willing to to use every dirty trick in the book in order to sell consoles. It's a fun series, but imagine a 3D plat former crossover game. So much untapped potential from this crossover. I love this series! Having all my favorite game characters in one game is awesome! I like how it's just not M&S, and they include not-often used characters as well. I would love to see a RPG with Mario and Sonic. A platformer could work too, but I would want to be Sonic the entire time! XD ...unless Luigi was playable. Grew up playing both Sonic and Mario yet have never played this series. Not interested in sports titles like this. Aside from speed differences, Mario and Sonic games are so different mechanic-wise that in my opinion it would be pointless to try and make a full "normal" game with both of them. There's more success with mashups like these Olympic games and the occasional crossover like Smash Bros. Maybe an RPG like Kingdom Hearts would work too. I think a classic platformer game would be difficult since the characters differ in their speed and just how their games work. It'd be interesting to see some kind of crossover RPG game though, like Mario and Luigi. Pretty interesting, but I thought "Game Informer" famously hated the Sonic franchise? Kinda odd to see something somewhat positive from them about it. I recall, one of their reviewers even stated (in their negative review of Sonic Riders Zero Gravity) "The only thing Sega can do with Sonic that would make me happy is to make him into a nice blue fur coat." I imagine that would be very painful to wear though, so he's kinda putting hate over his reasoning.